I’d be willing to bet that the first thing that comes to mind when thinking of the industrial revolution is early 1800s’ technology. Steam power, the weaving loom, and the introduction to mechanization. 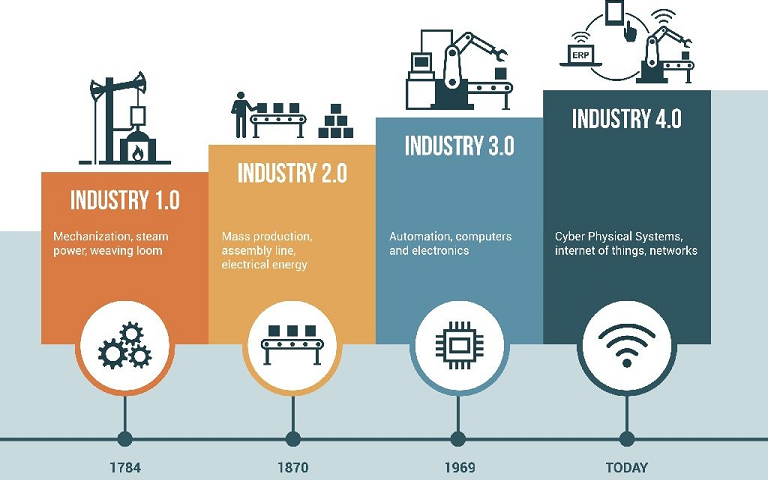 Today, the industrial revolution isn’t a specific time period, but rather phases of industries and the way businesses operate with new technology. Currently, we’re sitting at Industry 4.0. This new era of production uses new words and abbreviations like “Cyber Physical Systems”, “ERP”, “IoT”, and many more that can begin to hurt your brain. 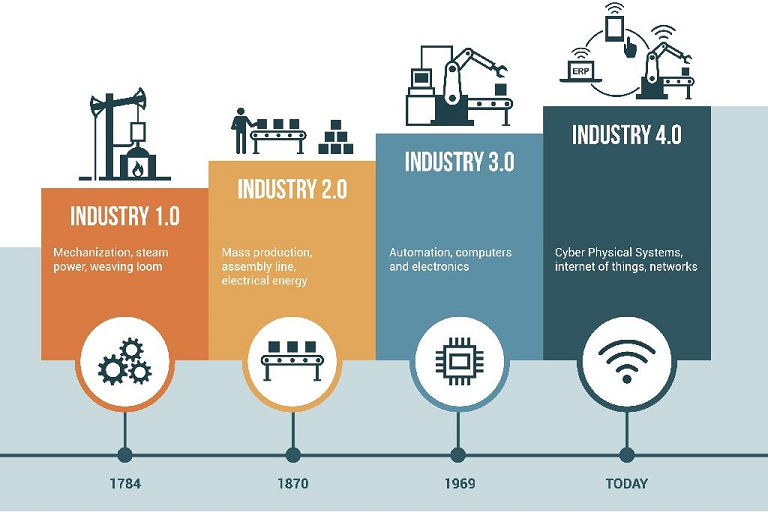 But before we get into Industry 4.0, let’s briefly go over the last 250 years and how the industry has changed. This is where those initial thoughts of the industrial revolution live. Between 1780 and 1870 the first industrial revolution took place with steam powered engines, weaving looms, and the need for child labor laws. Then came Henry Ford. Not the inventor of the automobile, contrary to popular belief, but one of the largest contributors to mass production and the assembly line. In 1913, Henry Ford revolutionized the way discrete manufacturing was conducted with assembly lines and conveyors. This process would bring the assembly of the Model N car from 12 hours down to 2 hours and 30 minutes in 84 discrete steps with the Model T.
Imagine that same assembly line, but with over half the workers replaced with machines. Like the scene from “Charlie and the Chocolate Factory”. This is a prime example of Industry 3.0’s overtake of the 2nd revolution. Industry 3.0 is the use of automation, computers, and electronics to complete tasks independent of each other. Basically each machine has one job and one job only. While Industry 4.0 uses machine interfaces along with internet capabilities to perform multiple tasks. Although first conceptualized in the early 2000s, the term Industry 4.0 wasn’t revived until 2011 at the Hannover Fair in Germany. The final report for its principles was presented at the fair in April of 2013. This is the ability for machines, sensors, devices, and even people to connect and communicate to each other via the Internet of Things (IoT). The IoT is a simple concept when you think of thermostats, security cameras at your house, or new door locks that can be accessed through your smart phone. If it has an internet connection, it can be accessed through a device. This is the basic principle behind IoT. The ability to gather digital information based off of real world statistics. For example, instead of an operator collecting weighing data on a printed sheet, that data is being sent to a database virtually as the material is being weighed. 1st: A system with the ability to support human decisions by aggregating data and displaying information that is easily comprehensible. This system would make it easy for workers to make informed and urgent decisions. 2nd: The utilization of Cyber Physical Systems (CPS) to support and help workers to perform tasks that are either unsafe, too exhausting, or unpleasant. This could be anything from CNC machinery to wirelessly controlled machines that were used in Industry 3.0. The ability for CPS’ to make decisions on their own and perform tasks as autonomously as possible. Okay Great, But Where Do Scales Come In? Well, in short, anywhere and everywhere you can find a use to weigh something. Weighing is the number one way to measure the production of goods since 2000 B.C. 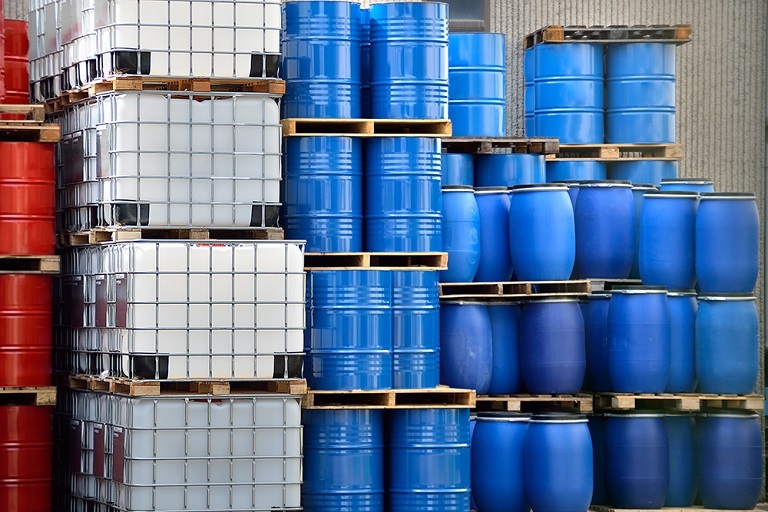 From cable length, to filling bottles and drums, to shipping, it is how manufacturing and logistics industries conduct business. And chances are, if you’ve found your way to this blog and are still reading, you’ve got a few scales in your facility. The weights and measures industry is no longer the standalone product industry. Scales, flow meters, x-ray, and metal detectors are far more autonomous than ever. The world is moving closer and closer to a completely autonomous production system where products independently communicate with the production devices and can automatically intervene in the process of production. 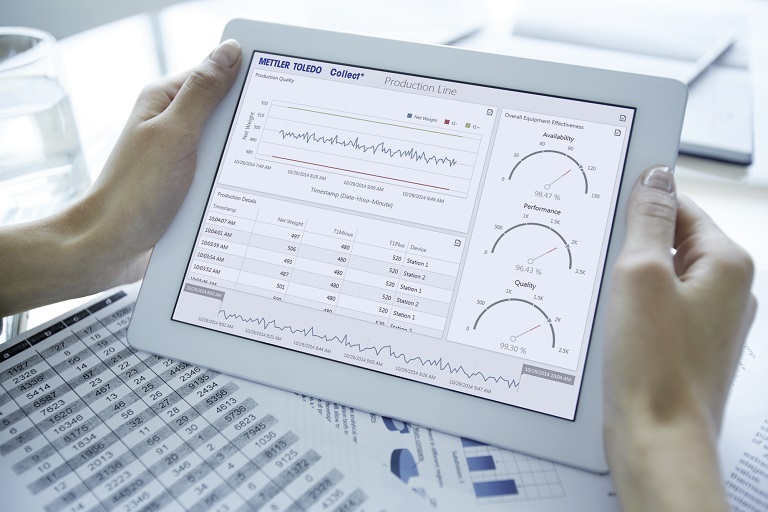 Integrating through PLCs and sending data and statistics to ERPs is essential in statistical quality control (SQC) and even conforming to HACCP regulations for the food and beverage industries. Most weighing terminals nowadays can even send input and output signals to PLCs or peripheral devices and control an entire system. Bundle that with software monitoring systems like FreeWeigh.Net and you’re on your way to an Industry 4.0 facility! How Can Industry 4.0 Compliant Networks Help My Company? Moving over to a more data oriented operation is key to being successful and compliant in Industry 4.0. Federal regulations and even the market is making it necessary to provide digital reporting of the production and transportation of goods. Production supervision begins at the facility’s gates. The use of truck and floor scales in receiving is the first line of measuring and recording incoming goods and verifying large quantities of stock. 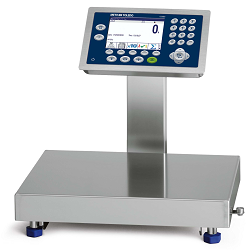 Weighing devices feed results and data to your network or ERP system and prevent over or out-of-stock situations. The IND780 weighing terminal is perfect for all types of logistic needs. The IND780 allows for monitoring and control of multiple scales for inbound and outbound operations including lift gates, traffic lights, and many other peripheral devices. Control filling with two-speed latching outputs and store target weights for specific products. Drive-780 software for the IND780 was designed with all truck scales in mind. 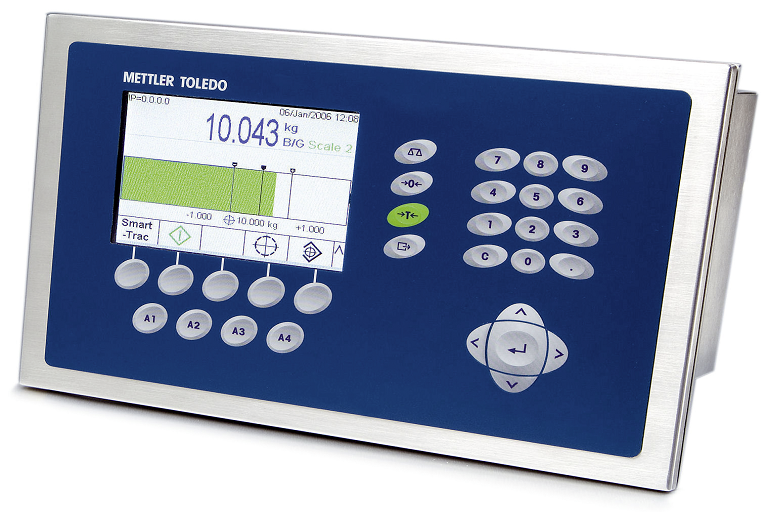 Use bench and counting scales such as the ICS685 (or ICS689 for the stainless steel, wash down version) from Mettler Toledo to perform picking tasks and cycle counts to prepare exact orders and deliveries internally. These scales and terminals can even communicate with existing ERP systems and prevent user error with prompting and colored notifications. Control inventory with the ICS685. From counting, to filling, to totalization, this bench scale can literally do just about all of it. The ICS685 can store up to 30,000 product SKUs with unique information such as tare values, product ID, name, and average piece weights with DatabICS software. 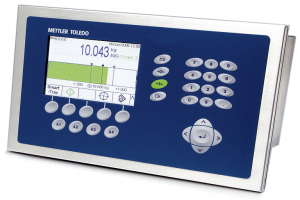 Transfer weighing and product data after weighments via serial communication, USB, Ethernet, or WLAN. Waste and quality cases are significantly reduced with advanced piece counting and quality check solutions. 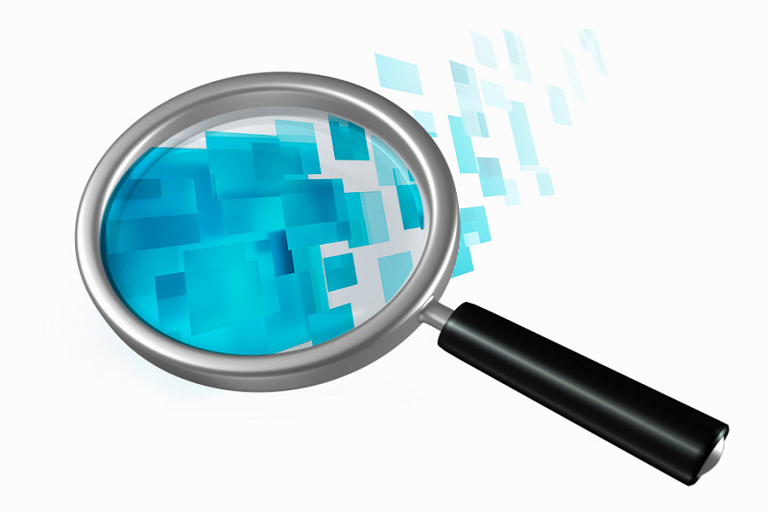 You can save article and product ID information using scale management software like Collect+ and recall it anytime via centralized PC in the network. Collect+ doesn’t just capture data for one scale. 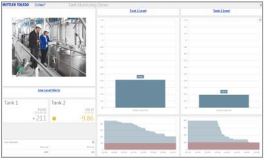 The software can collect data from every scale on the floor and visualize it on an easy to read and understand dashboard. This data can easily be used for audits, quality initiatives, process automation, and even worker efficiency. Know who, what, where, and when with every weighment. A key component in Industry 4.0 is preventative maintenance. Which means monitoring equipment such as weigh modules, load cells, and scales to prevent downtime. Remote support and monitoring facilitates fast repairs and reduces the need for on-site intervention during working hours. It also prevents unexpected downtime. Which we both know is more costly than preventative maintenance. Remote monitoring can be already software embedded in current products on the market, such as TraxEMT™ in PDX™ and PowerCell™ load cells. What Can We Expect with Industry 4.0? With newer HACCP updates and increasing reporting demands by the FDA as well as consumer expectation of 100% accountability, it’s only a matter of time before Industry 4.0 practices are mandatory. Currently 33% of manufacturers that were surveyed reported that they have high levels of digitization. This is projected to increase to 72% by 2020. Whether it’s an evolution through federal compliance or a means to remain competitive, Industry 4.0 is coming and will be mandatory for any manufacturer. Cincinnati has actually labeled themselves an “Industry 4.0 demonstration city” to encourage innovation and investments into their manufacturing sector. Whatever the case may be, 4.0 is coming and we need to be ready. If your scales aren’t currently connected to databases or have incurred too many costs due to unexpected downtime, give us a call or fill out a form. See how the cost of automation and database integration can save more money and increase production efficiency. Let us help you prepare for Industry 4.0!